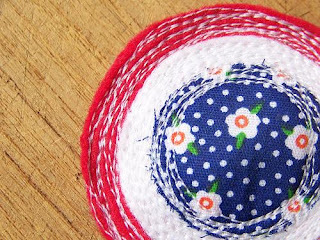 I have become slightly addicted to sewing these brooches, going round and round in circles is so much fun. Or maybe it is just hypnotising me into slight craziness, who knows. I am waiting on some more brooch backs to arrive to make more of them as these ones are off to a shop and I need to make more for my Notonthehighstreet shop. I am also shopping around for new fabrics to make a new design and think I may have found the perfect thing but that is a whole other post. I would say that half of the fun of making thing is shopping for the parts that you need to make your design. I never thought I would say this but fabric shopping is as fun as clothes shopping and if any of you have ever seen my wardrobes (yes plural) then you would know that this girl likes to shop. 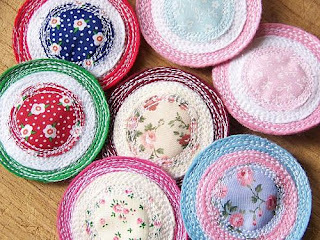 they're brilliant, although a little hypnotising when you start to follow a thread pattern!